Until recently the only way to get to 300mm reach in the full-frame Sony FE world was via the use of adapters with A-mount or third-party lenses. That all changed with the recent introduction of the versatile Sony FE 70-300mm f/4.5-5.6 G OSS lens, and we've now had the chance to shoot a gallery collection across the available zoom range for a real world look at this far-reaching full-frame offering. Two extra-low dispersion glass elements, four aspherical elements and Nano AR coating are reported to reduce distortion and aberration issues, while the relatively close-focusing ability (0.31x at 2.96 ft or 0.9 m) promises good performance for "tele-macro" photography. Additionally, the onboard Optical SteadyShot I.S. system is intended to assist handheld shooting as that rather generous zoom range is utilized. How did they fare in these endeavors? We'll have a full lab test review coming soon, where we'll explore these and other questions regarding this new telephoto zoom. In the meantime we wanted to present this real world gallery so that you could begin taking a look at a variety of imagery and settings, as well as the bokeh characteristics available from this long-zooming lens. These images were all shot handheld on the award-winning Sony A7 II, which won the Best Enthusiast Mirrorless category in our Camera of the Year awards for 2014. Sporting the world's first 5-axis image stabilization system for a full-frame ILC, the onboard I.S. actually works in concert with the OSS aboard the Sony FE 70-300mm lens, a dual I.S. technology now employed by several mirrorless manufacturers (Olympus and Panasonic are currently the other two offering this lens + body I.S. technology with select cameras and lenses). The presence of image stabilization with long-zooming lenses is all but a must these days, and allows a great deal of freedom for being unencumbered by a tripod for a greater shutter speed range than for lenses and/or bodies without onboard I.S. As I've mentioned in previous gallery posts for lenses, I have fairly steady hands, though not rock-solid like some photographers I know, so my results are what you should expect from hands of average to slightly above-average steadiness. Shooting my most dependable feline model from about 5 feet, the depth of field at 300mm at f/5.6 on a full-frame sensor works out to roughly a quarter of an inch, or about 7 millimeters. This is shallow enough to blur even the foreground and background elements in this 1:1 crop, yielding a nice effect for certain portraits, but of course makes nailing the accurate focus point all the more critical. For a flatter target, a faster shutter speed and a lower ISO for comparison we'll take a look at my new local buddy the goat, lazing in the sun and posing patiently for me (after I bribed him with a big outlay of carrots and various fruits). His fur allows a good bit of fine detail for checking out the handheld sharpness potential. 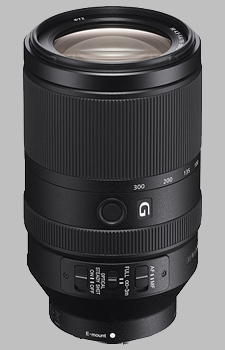 The combination of the Sony FE 70-300mm G on the A7 II body weighs in at about 3.3 lbs or 1.5 kg. That's certainly not lightweight for the modern enthusiast camera world in general, but for a 300mm full-frame reach it is a modest weight in comparison to some of the more traditional offerings from the DSLR world. I found it fairly comfortable to carry around for extended periods, especially given the deeper grip on the Mark II versions of the full-frame Sony Alphas. The balance of the two feels secure and reassuring, and the weight does provide some extra measure of handheld stability. Autofocus employs a linear actuator which is reported to offer fast and precise AF performance, and I found this to be true in my own shooting experiences. On the A7 II I rarely had to wait for much if any "hunting" except a few times when the light got low at dusk. As with many modern lenses the 70-300mm FE has a handy limiter switch which constrains the focus limit to 9.8ft to infinity, thereby reducing any potential hunting time if you're subject is far in the distance. We'll be taking a closer look at AF speed in our full technical review. Head to our Sony A7 II Gallery for more images with this lens (denoted with "70-300" in the title) as well as the associated EXIF data and access to the full resolution files. Stay tuned for our full technical review still to come! This lens is quite big, heavy, and expensive for its modest specifications. There is nothing too bad or too exciting about this lens. It's not as sharp as a good copy of 70-200, but it's not as bad 24-240 either, it's just average almost as good as Canon 70-300/4-5.6 IS USM. My copy of Canon is a bit sharper at 300mm though. The worst thing I experienced with this lens is its AF. It's slow, especially if lens decides to travel from one end to another. And it's also unreliable, too many pictures I had showed front focusing. My copy also showed noticeable decentering at 300mm. Overall this lens trails somewhat behind the Canon 70-300 despite being 2.5 times more expensive. I would expect something better optically and mechanically at that high price point.